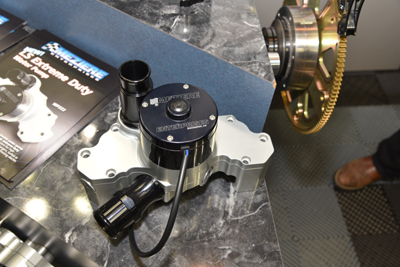 Meziere Enterprises had a bunch of great new products at the show, including their new LS Extreme Duty Water Pump (#WP333). This 55 GPM is designed for high-compression, high-horsepower applications where superchargers, turbos or nitrous is employed. 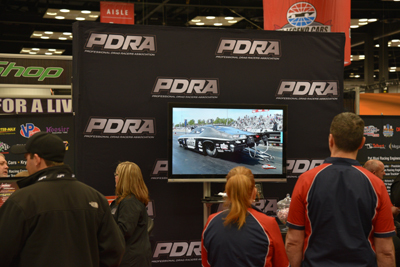 Also on display was their trick Powerglide transmission pan (#WTP310). It has a heat exchanger built into the bottom of the pan that is hooked into the vehicle's coolant system. This system has proven extremely effective when consistency of the vehicle is key. 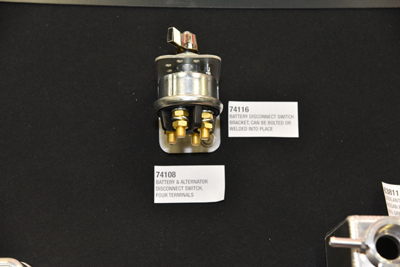 One of the best products at the show was Meziere's new SafeCap locking radiator caps (#s WCC300 - WCC308). 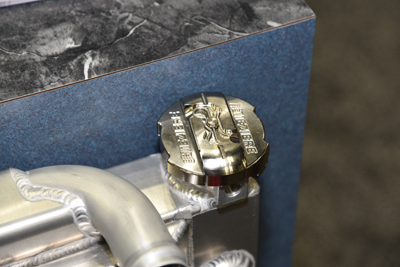 The locking shell and clip ensure a failsafe, secure radiator cap. Last but not least were the sharp cap & bung assemblies. Visit www.meziere.com. 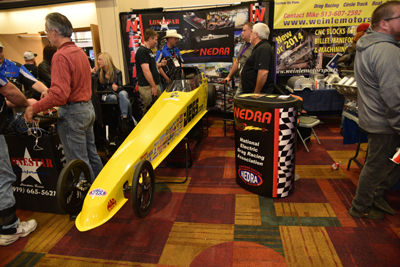 Visit Meziere's expanded PRI Show listing HERE. 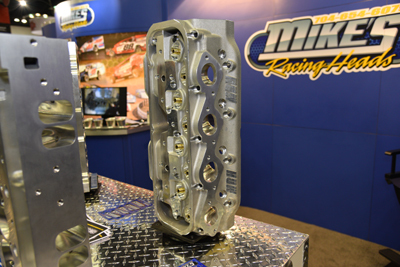 Mike's Racing Heads had a nice display of their heads at the show. 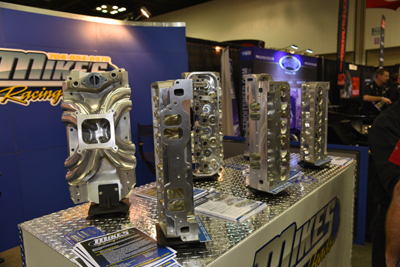 Their work includes the following castings: Brodix 23°, Edelbrock 15°, Brodix SR20, and their own MRH-18° Drag Race Head, designed for 585-632 c.i. race engines. These flow 500+ cfm Intake and 340 cfm exhaust. Visit www.MikesRacingHeads.com. 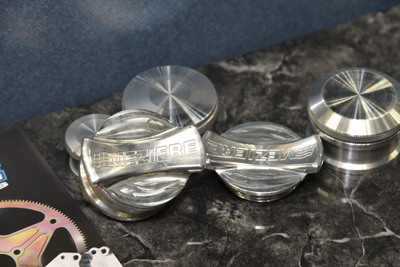 What can you say about Moroso Performance Products! 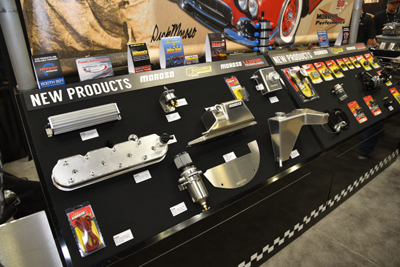 They always bring a ton of great new products to PRI. 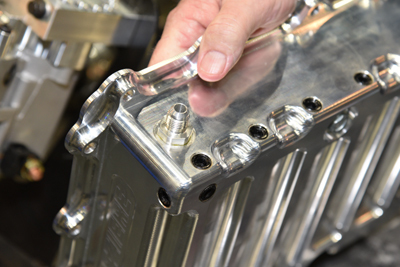 How about that sharp Billet Aluminum Tall Valve Cover for GM LS engines in the top right photo (#68488) and the Breather Tank (#85468) with two -10 fittings and a bottom drain. 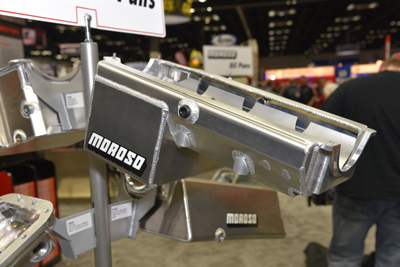 Then there's the Chevrolet Small Block Oil Pan (#21234) with 8 quart capacity and double kick-out design for large stroke clearance. There's also the four-terminal Battery & Alternator Disconnect Switch (# 74108). Check out all of Moroso's products at www.Moroso.com. 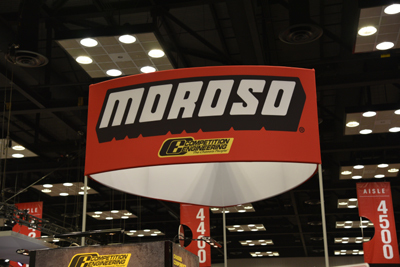 Visit Moroso's expanded PRI Show listing HERE. This is interesting. 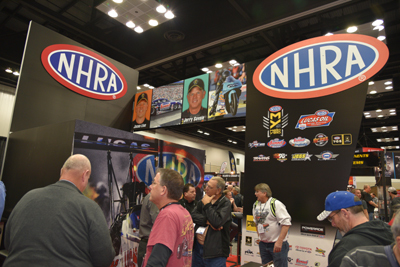 Mr. Race Oil Custom Shop, part of the Cam-Shield company, produces high-performance synthetic racing oil designed specifically to your engine, your fuel, your operating conditions and your type of racing. If you look closely at the name on the white jug, it says J. Savoie so there must be something to this! 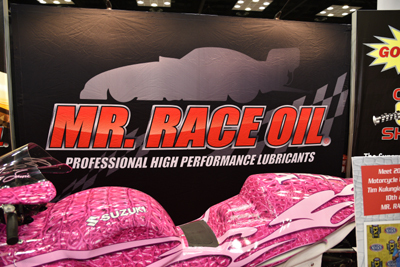 Visit www.MrRaceOil.com for more information. 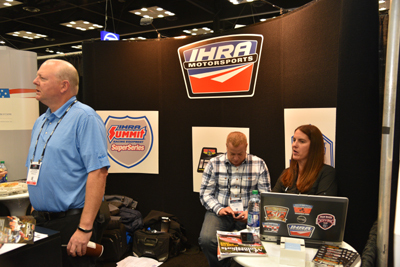 The sanctioning bodies and racing organizations all had a presence at PRI: IHRA - International Hot Rod Association (www.ihra.com), NEDRA - National Electric Drag Racing Association (www.nedra.com), NHRA - National Hot Rod Association (www.nhra.com) and PDRA - Professional Drag Racers Association (www.pdra660.com).